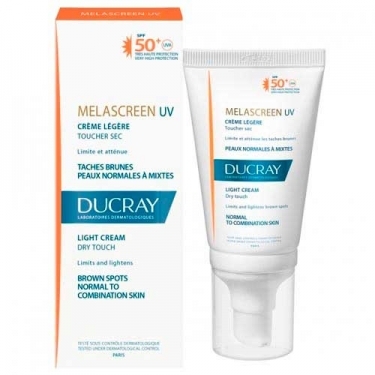 DESCRIPTION: Melascreen UV Crème Légére SPF50+ from Ducray is a cream indicated to avoid stains caused by sun exposure. Protects sun-related hyperpigmentation, local brown spots or age spots. The lightweight Melascreen SPF 50+ UV cream softens and fades brown spots: its broad-spectrum photoprotective system protects against UVA and UVB rays; the Rona Care AP helps to staining and protects from photoaging. Its anti-glare and dry-touch texture is invisible, photosensitive and resistant to water and sweat, even in hot climates. No parabens and no perfume. Non-comedogenic. Hypoallergenic. Apply every day, all year round.